"What if anything were possible?" Over the years, Cirque du Soleil has morphed from a small-scale artsy performance/alt-circus into a multi-billion dollar artsy performance/alt-circus empire, with a number of concurrent shows and performing groups around the world, including a few year-round troupes in Las Vegas and Orlando. A typical Cirque show consists of some sort of esoteric underlying theme, punctuated by a dizzying array of surreal costumes, hypnotic music, elaborate staging, and some truly beautiful acrobatic and visual moments. To call it a "circus" is too simple, and too call it "theater" doesn't seem to do it justice, either. 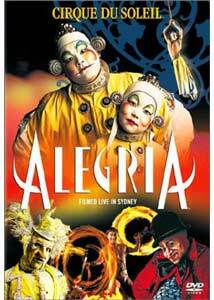 This disc, a 1998 performance of their Alegr�a tour filmed in Sydney, does its noble best to reproduce the mind-numbing and dreamy excess of a live Cirque show. That, my friend, is a tall order, and the end result here is a tightly-edited representation that appears to capture the inventive artistry and overall exuberance, though director Nick Morris relies on more audience reaction shots and slow-motion shots than I personally cared to see. Who cares if the theme of Alegr�a is a tad bit confusing, with its angelic White Singer apparently struggling with the dark power of the Black Singer, or the creepy hunchbacked ringmaster who cackles and roars like a pesky spirit? It's all about the visual punch, and Alegr�a delivers majestically. Elena Lev's stunning and ambidexterous hoop work, which occurs about midway through, is one of the show's standout moments, and though on a really simple level it can broken down to nothing more than a girl with hula hoops, the presentation (the stage, the music, Lev's stoic expression) all combine to give her act a slowly-percolating intensity. There is much to enjoy with Alegr�a, from the unusual aerial work to a very flexible contortionist to manic leaping and cartwheeling to a brilliant performance bit entitled Storm, where a forlorn clown encounters a disembodied jacket that eventually becomes a strange and moving act about lost love that mixes elements of mime and theater. Image Transfer Review: Columbia TriStar has issued Alegr�a in smart-looking 1.85:1 anamorphic widescreen, though at times it seems a struggle to contain all of the visual grandeur the performance within the constraints of the aspect ratio. Colors, however, are generally very warm and natural, even if the overall image detail borders on the soft side. Audience shots, of which there are far too many, suffer from bleed and some noticeable grain, while the performance footage looks consistently strong. No print defects, nicks or scratches to be found. Audio Transfer Review: An encompassing Dolby Digital 5.1 is provided here, and it does a nearly perfect job in presenting the swirling wonderment of a live Cirque performance. There's no dialogue to speak of, short of the haunting title track, but the rhythm-heavy Rene Dupere score is reproduced with deep, rich bass, even if the high end is lacking slightly. Well-mixed rear channel cues, especially audience sounds, enhance the full soundstage greatly. Extras Review: Nicely done extras allow viewers to meet the performers, who largely remain anonymous during the performances. A Journey To Alegr�a: A Special (33m:02s) is a made-for-Aussie television documentary that goes backstage, and the amicable host chats it up with the majority of the primary acts. Some may not appreciate the shattering of the fourth wall by putting names to the faces, but after watching the performances I personally wanted to know who these folks were. Filming Alegr�a (19m:17s) tackles and addresses the technical challenges of filming the production, and in the process also highlights some of the acts. Rounding out the background info is the succinct Meet The Artists (15m:37s), a quick little segment where each performer gets to say who they are, where they're from, what they do, and how long they've been with Cirque. A Multi-Angle Performance feature provides four separate viewing angles for two of Cirque's acts (The Fast Track and Aerial High Bar). The interface looks nice, but the functionality was a little slow on my player, but it merits a peek for the overhead camera angle. A Different Perspective (05m:41s) is a slo-mo "best of" reel of various acts, set to the title song. Also included is a commercial for Cirque du Soleil audio discs, featuring their dreamy, surreal music. The disc is cut into 16 chapters, and though the backcover states there are subtitles in English, French, German, Spanish, Japanese and Chinese, none appeared on my particular copy. Dreamy, beautiful and often quite amazing. That's Cirque du Soleil in a nutshell, and Alegr�a is one of their finest, second only perhaps to Quidam. For an added dramatic boost, I suggest you watch the feature film version of Alegr�a (starring Frank Langella, as well as the Cirque troup) in conjunction with this performance disc.